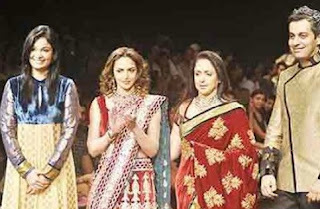 INDIA/ ENTERTAINMENT NEWS - Bollywood actress Hema Malini and daughter Esha Deol were the showstopper on Friday on the third day of ongoing Lakme Fashion Week Winter/ Festive 2011. Both strutted down the LFW ramp in saree and lehenga choli designed by Shyamal and Bhumika. Hema Malini, (62) was in a maroon color saree having velvet part and brocade layers. Esha Deol was in highly-embolished maroon color lehenga choli. The saree and lehenga choli collection of the mother-daughter duo was inspired by the 17th century old Jamaas, Peshwas, Chogaas, Achkans and Kaidar Lehengas. Lisa Haydon, model-turned actress, walked the LFW 2011 ramp on Friday for the collection of designer Anita Dongre that showcased exquisite collection. 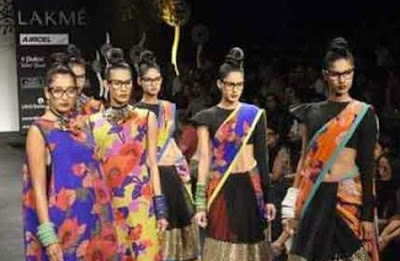 The third day ended of LFW Winter/ Festive 2011 ended with the creation of Sabyasachi Mukherjee for men, women and children. Bollywood actresses Sridevi and Vidya Balan cheered in the front row. Sridevi was in a green sari having golden border and red blouse, and Vidya Balan was dressed in off-white saree having black border and peach pink blouse. Famous Kathan dancer Mitul Sengupta dazzles with her expert foot work with the Kathak chants and beat. The show winded for the day with the sound of Vande Mataram.